I spend a lot in markets, in terms of both time and money. A lunchtime trip to the fruit, veg, fish and meat stalls of Kirkgate Market in Leeds has become a weekly ritual, and I return to the office with one of those blue IKEA bags full of stuff. My colleagues ask me what unspeakable things I’m hiding in the bottom of the communal fridge for the afternoon, having found out I’ve used the redundant salad drawer to temporarily confine a lobster for the afternoon once or twice. I’m very fond of Kirkgate Market. I have a little extended route to work that winds from the station, along The Calls and back up through the market, further than strictly necessary, in the name of general fitness, and I see the place waking up, the fishmongers shovelling ice, the butchers stacking up meat in their windows, the woman on the spice stall sorting out bundles of herbs. I check every morning how good the bunches of parsley are looking and go back later if there’s been a fresh delivery. It’s a great place, but not without its problems. I wrote a piece a few years ago for the brilliant Culture Vulture about the way that I thought the market had lost its direction a little, and perhaps a bit of its soul, and I think that much of what I said then rings true today. There’s some change in the air – a huge development right next door will land an upscale shopping centre and a John Lewis on the market’s doorstep, which is certainly going to shake things up, and there’s a fair amount of work being done on the market buildings and layout as well, which it’s fair to say is a bit of a mess, ranging from architecturally stunning Victorian buildings right through to constructions from the eighties that it would be kind to call ‘hangars’. This work is badly needed, and not before time – parts of the place aren’t fit for purpose, and others are just falling down – but it’s been controversial, as these schemes often are. There’s been a ridiculous amount of unrelentingly negative grumbling going on for years about changes to the market halls and how they should or shouldn’t be done. It’s good that something is happening right now, but I suspect that the council won’t go far enough, that their vision for the market is limited, that they won’t grasp the opportunity to do something really magnificent with the place. ‘Big change’ has been done elsewhere to stunning effect. 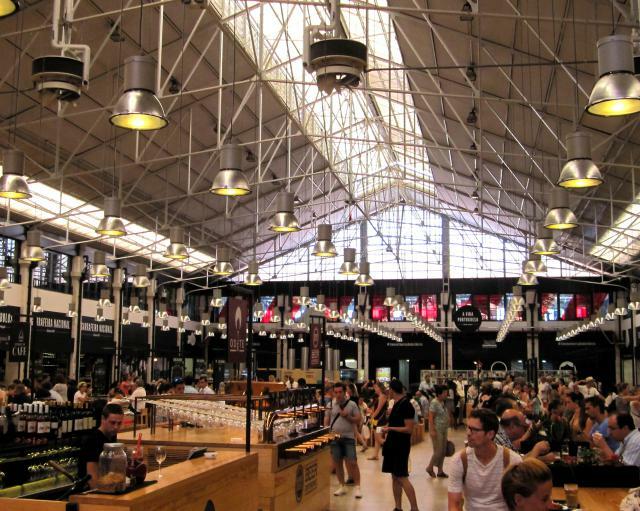 I spent a little time in Lisbon, in Portugal, last month, and discovered Mercado da Ribeira, one of the city’s oldest market sites, with a history dating back to the middle ages and once regarded as one of the best fish markets in Europe. It’d become tired, worn out and listless, but was redeveloped with a new direction in 2010, under the guidance of Time Out, who created a huge food court in the very centre of the market, flanked on either side by butchers, fishmongers and grocers. The place is a very much a working market, complete with the sights, sounds and smells familiar to every market the world over, but Ribeira has built a new slant in collecting together thirty-five food outlets around a central courtyard, and jockeying for Lisbon’s top names in the food industry to run them. The results are impressive, and the food even more so, with the best of Portuguese cuisine on show. There’s a real ‘fork to plate’ feel about the place. It’s also incredible fun. There’s life, and bustle, people doing their normal shopping alongside office workers out for a coffee or a quick lunch. It’s a well-loved, well-looked after space that sets out to be the best and achieves it. Yes, there are gimmicks … a serve yourself beer vending contraption right in the middle could be more usefully replaced by, well, a bar, but the overall feel is that things fit together well, that Ribeira has been redeveloped and refurbed, but not necessarily gentrified. There have been genuine improvements, and those improvements have clearly changed the way the market works for the better, turning it into both a utility and a destination. I saw people finish their lunch and head straight out to the stalls to buy stuff for later, using the market as a market should be used. I like this model, this sense that somebody had a slightly crazy idea and decided to go for it. It shows guts and determination, and the result is a communal space that serves a clear purpose, built firmly upon the history and heritage of the place, whilst still capturing the new and creative. I hope Kirkgate takes a look at Ribeira and at least has a good long think about what it could become and how it might stay relevant as the city around it changes. I hope that some of the bravery that underpins Ribeira’s success rubs off on Kirkgate and that big decisions are made and carried through.